-v is used to connect folders in the docker container to local folders. See Dataset Structure for reference on the project layout. For more information about Docker, check out their docs. You must change project_path: '' to add an absolute path to somewhere on your machine. Whenever you run a new project, it will be saved here. Then sit back, grab a coffee and wait. You only have to specify --images </path/to/images> on the first run. features leads to better results but slower execution. longer to compute but produce denser point clouds. the standard deviation threshold to include patches. Patches with lower standard deviation are ignored. provides similar results in planar areas. performed with MVE. Higher values discard more points. not need a full 3D model, turn on this option. smrf by tweaking the --dem-* and --smrf-* parameters. --pc-csv              Export the georeferenced point cloud in CSV format. ground only) using a progressive morphological filter. Check the --dem* parameters for fine tuning. filter. Check the --dem* parameters for fine tuning. Simple Morphological Filter elevation scalar parameter. Set this parameter if you want a stripped geoTIFF. gdal_translate if you don't know what you are doing. Options: JPEG, LZW, PACKBITS, DEFLATE, LZMA, NONE. --build-overviews     Build orthophoto overviews using gdaladdo. --version             Displays version number and exits. The format of the GCP file is simple. The header line is a description of a UTM coordinate system, which must be written as a proj4 string. http://spatialreference.org/ is a good resource for finding that information. Please note that currently angular coordinates (like lat/lon) DO NOT work. If you supply a GCP file called gcp_list.txt then ODM will automatically detect it. If it has another name you can specify using --gcp <path>. If you have a gcp file and want to do georeferencing with exif instead, then you can specify --use-exif. This post has some information about placing Ground Control Targets before a flight, but if you already have images, you can find your own points in the images post facto. It’s important that you find high-contrast objects that are found in at least 3 photos, and that you find a minimum of 5 objects. Sharp corners are good picks for GCPs. You should also place/find the GCPs evenly around your survey area. The gcp_list.txt file must be created in the base of your project folder. For good results your file should have a minimum of 15 lines after the header (5 points with 3 images to each point). It is possible to build a reconstruction using a video file instead of still images. The technique for reconstructing the camera trajectory from a video is called Simultaneous Localization And Mapping (SLAM). OpenDroneMap uses the opensource ORB_SLAM2 library for this task. We will explain here how to use it. We will need to build the SLAM module, calibrate the camera and finally run the reconstruction from a video. The SLAM algorithm requires the camera to be calibrated. It is difficult to extract calibration parameters from the video’s metadata as we do when using still images. Thus, it is required to run a calibration procedure that will compute the calibration from a video of a checkerboard. We will start by recording the calibration video. 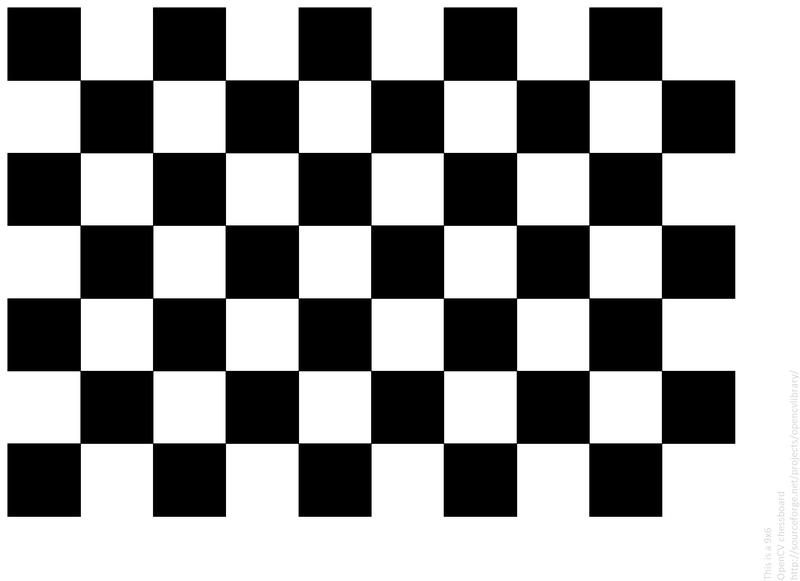 Display this chessboard pattern on a large screen, or print it on a large paper and stick it on a flat surface. Now record a video pointing the camera to the chessboard. While recording move the camera to both sides and up and down always maintaining the entire pattern framed. The goal is to capture the pattern from different points of views. Keep this text. We will use it on the next section. We are now ready to run the OpenDroneMap pipeline from a video. For this we need the video and a config file for ORB_SLAM2. Here’s an example config.yaml. Before using it, copy-paste the calibration parameters for your camera that you just computed on the previous section. where PROJECT_PATH is the path to the folder containing the video and config file, VIDEO.mp4 is the name of your video, and VIDEO_WIDTH is the width of the video (for example, 1920 for an HD video). That command will run the pipeline starting with SLAM and continuing with stereo matching and mesh reconstruction and texturing. It is highly recommended that you calibrate your images to reduce lens distortion. Doing so will increase the likelihood of finding quality matches between photos and reduce processing time. You can do this in Photoshop or ImageMagick. We also have some simple scripts to perform this task: https://github.com/OpenDroneMap/CameraCalibration . This suite of scripts will find camera matrix and distortion parameters with a set of checkerboard images, then use those parameters to remove distortion from photos. First you will need to take some photos of a black and white chessboard with a white border, like this one. python undistort.py --matrix matrix.txt --distortion distortion.txt "/path/to/images/"
docker build -t cc_undistort .